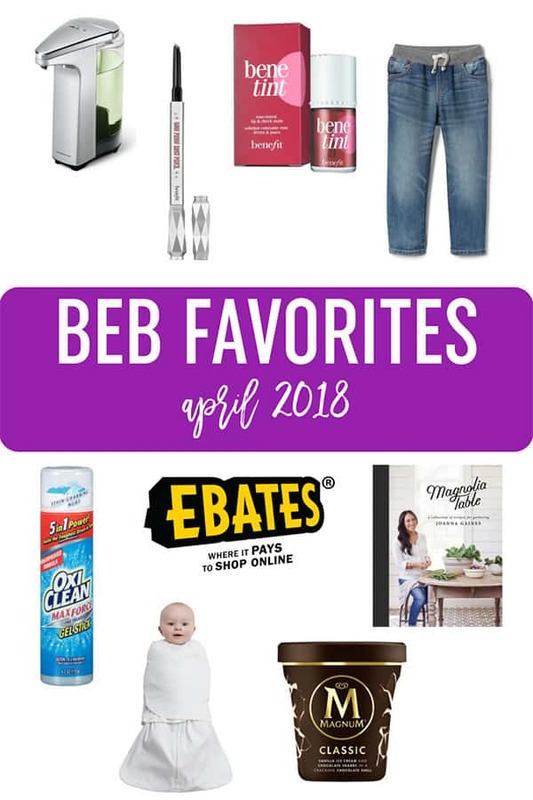 Welcome to the April installment of BEB favorites! It’s the last Monday of the month, which means it’s time for another BEB favorites! Simple Human Touch-Free Automatic Sensor Soap Pump – A couple of months ago, I asked for recommendations on soap pumps and a lot of you recommended this hands-free model. I bought one for the kitchen and after having it for only a few days, ordered another one for the powder room. It’s seriously the best! I love not having to touch it, which is great in a messy kitchen, and also in a powder room where it gets a lot of use and we’re trying to combat germs constantly! Benetint Cheek Stain – I bought this a few weeks before having Isabelle, as I wanted an easy cheek stain to pack away in my hospital bag. I’ve used the Josie Maran cheek gelée before and love it, but this Benetint is super pigmented (a little goes a loooooong way) and I can’t believe the staying power! I put it on in the morning and it looks exactly the same when I go to bed. Benefit Goof Proof Brow Pencil – I’ve had this in my Sephora loves list for months and months after seeing many people rave about it, but it was sold out forever up until a little while ago. When I saw it come back in stock, I snatched one up immediately and it is seriously the best brow pencil I have EVER used. The angle of the pencil is exact and it distributes the perfect amount of color. Gap Toddler Slim Fit Jeans – It took me a really, really long time to find jeans that fit Joseph well, and I finally found them at Gap last year. The original version I bought isn’t available anymore (“stretch original pull-on jeans”), so when I needed to get him longer jeans, I tried this slim fit version and they were just as great, albeit with legs that were a little slimmer towards the bottom. They’re so soft (both versions!) and always look nice; I definitely recommend if you have trouble finding jeans that fit! OxiClean Max Force Gel Stick – Oh my gosh, I swear by this stuff! I always have a stash in the laundry room and it has totally saved so many pieces of clothing. No joke, I have taken the boys’ white shirts that are COVERED in spaghetti sauce, hit it with this stain stick and once they go through the wash, you’d never know there was a single speck on them. It’s totally magic; I hope they never stop making this! Ebates – My aunt told me about Ebates a couple of months ago, and I love it! I do almost all of my shopping online and it’s exciting when I load a website and see the little Ebates box pop up to say there is cash back available. They’re just regular stores I shop at anyway, so getting a little kickback is so nice! HALO SleepSack Swaddle – One of my very favorite baby products ever! Joseph absolutely hated being swaddled, but Dominic loved it and so does Isabelle. I absolutely just could not with the whole trying to wrap a blanket into a swaddle. It was never tight enough, arms always came out, and I was paranoid that it was going to creep up over their face and suffocate. These swaddles are a dream – easy to wrap the baby up and they VELCRO so you can get a super tight swaddle and there is nothing around their face. I would buy one for every single person I know having a baby! Magnum Milk Chocolate Vanilla Ice Cream – GAH, I just discovered this a couple of weeks ago and it is my new favorite ice cream treat. The ice cream is thick and creamy, it’s FULL of chocolate chunks, and the entire pint of ice cream is encased in chocolate shell that you can crack and break apart by squeezing the carton. It’s not going to help me lose the baby weight, but my goodness is it delicious! Magnolia Table Cookbook – I think I mentioned this on a Friday Things, but I am 1000000% in love with this cookbook. It is absolutely packed with total comfort food recipes, which is totally my jam. I’m not really into fancy, crazy, wild concoctions of recipes… I just love simple, delicious, familiar food, and that is exactly what this cookbook delivers. I want to make ALL THE THINGS. That’s a wrap with what I’ve been loving recently! I would love to hear about some of your new favorites as well; share them in the comments below! This is not a sponsored post and I have not received compensation from any of these companies to talk about their products. The above post may contain affiliate links. There are 5 cookbooks calling my name right now and Magnolia Table is screaming loudest. This surprises me because although I know who Joanna Gaines is, I couldn’t be called a fan. The recipes seem to be things that I would be interested in making, eating and serving family and friends. As a retired nurse, the touch-free soap dispenser as a way to stop the spread of germs makes me chuckle. One of the things we never worried about was touching the soap dispenser. The next thing we were going to do was wash our hands. What we did worry about was touching faucet handles after washing our hands. We were taught to use a paper towel to turn off the water. At home I cleaned the faucet handles and changed hand towels daily. I really didn’t worry about germs, except those I might bring home from work on my shoes. I cannot WAIT to try that ice cream. I keep eyeballing it at the store! A new product I tried recently that I absolutely loveeee is the Dove Body Polish in “crushed macadamia & rice milk.” Gah, it smells so good and I’ve been using it to gently exfoliate every night. It makes skin so soft! I can’t wait to get my hands on a copy of Magnolia Table. In my opinion, everything Joanna Gaines touches is gold! Also, I’m a huge fan of Ebates. It’s the easiest cash-back site I’ve found.